H+E refurbished an existing Sugar Wastewater Treatment Plant in Scandinavia. The existing wastewater ponds had the disadvantage of both consuming large amounts of energy and also not meeting the necessary treated wastewater quality requirements. Therefore, the client decided to replace the essentially redundant equipment with up-to-date technology. Sugar Wastewater Treatment is not straightforward. However H+E has extensive experience in this market. It has been a leading provider of wastewater treatment systems for the companies throughout the sugar industry for many years. We developed our unique technology and energy-efficient solutions to meet the specific demands of the sugar industry. This was the main factor in the Client’s decision to choose H+E. Our aerobic BIOFIT®.N process uses combined denitrification and nitrification stages to safely and efficiently remove nitrogen. This compact solution has been proved many times in the sugar industry to be a reliable and highly efficient method for treating wastewater. 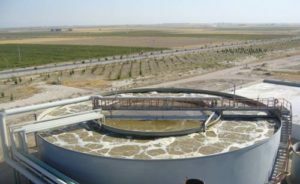 It uses a particular type of fine bubble membrane aeration of the activated sludge basin. This results in a substantial reduction of energy consumption, and therefore leads to a rapid return on investment for the client. Integrating it with the existing equipment reduces total investment costs. BIOFIT®.N is one of a family of BIOFIT processes. The aerobic BIOFIT®.N system started operation right on schedule for the 2017/2018 campaign. H+E has also developed the two-stage ANAFIT-CS system. This particularly suits wastewater with a high calcium concentration, usually found in the sugar industry. It avoids operational problems which are often caused by calcium carbonate clogging, commonly seen in other treatment processes. As a result, ANAFIT-CS systems operate reliably and dependably.